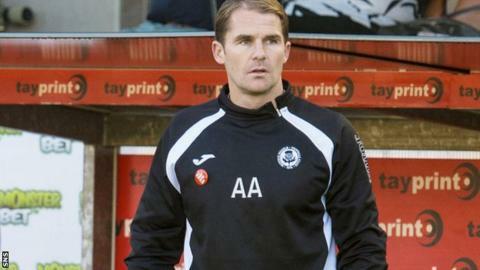 Partick Thistle manager Alan Archibald was left shocked that his side returned pointless from their trip to Tannadice. Dundee United won the match 1-0 thanks to Nadir Ciftci's late penalty after the striker was downed by Danny Seaborne, who was then red-carded. "I thought it was a fantastic performance," Archibald told BBC Scotland. "We put enough into the game to get at least a draw, if not a victory. I'm bitterly disappointed with the goal." The Jags lost 4-1 on their two visits to Tannadice last term and Archibald is sick of the sight of the place. "Their keeper had a couple of good saves and to be fair they had a couple of good chances as well," he added. "We hit the bar [through Christie Elliott] and I thought we were the better team in the second half - it's just not a happy place for us to come to be honest." The Thistle players were convinced Ciftci was offside when he received the ball in the build-up to the penalty, and their manager insisted it was a huge call. "Our players are telling us he looks two yards offside," Archibald said. "The fourth official says it touched our player on the way through but it's hard to see on our footage. "The disappointing thing is we lost a penalty from it and a centre-half for next week's game, so I hope they're correct." Archibald's side remain six points clear of bottom side Ross County and Archibald was not too downbeat after the defeat on Tayside. "There's loads of positives," he said. "You see how good United have been playing, they're flying high at the top end of the table and we ran them very very close and should have taken something from the game. "It was a very good away performance."